Famous Azerbaijani singer Tarana Mahmudova performed with a concert at the International Mugham Center on November 28. The evening of jazz was dedicated to the 20th anniversary of the creative activity of Tarana Mahmudova, Trend Life reported. The concert program featured Azerbaijani folk compositions in jazz processing, modern jazz pieces and improvisations, which were met with applause from the audience. 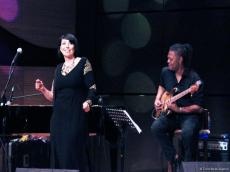 The performance was accompanied by world-class bass guitarist, jazz superstar Linley Marthe (France), famous drummer, participant and laureate of the international festivals Zaza Tserdtsvadze (Georgia) and talented pianist Elbey Mammadzade (Azerbaijan). The host of the evening was Tofig Hasanov. The audience was treated to an array of world class performances.